People from all over Seattle and beyond visit the waterfront — but downtown property owners have front-row seats. As a promenade, renovated park, walkway to Pike Place Market and street improvements add to the beauty, City Hall may want those property owners to pay up. Though people from all over Seattle and beyond visit the waterfront, downtown property owners are sitting in the front row as the city seeks to reconnect the heart of the urban landscape to Elliott Bay, said Marshall Foster, director of the city’s Office of the Waterfront. 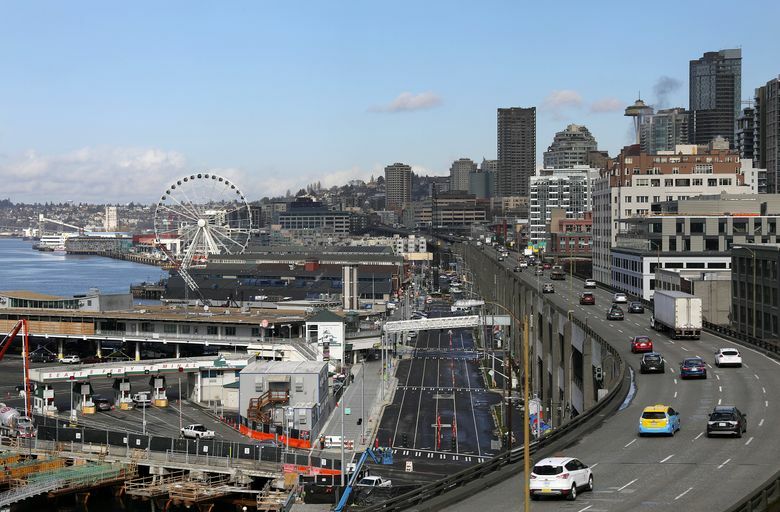 Seattle has used LIDs to build the Aurora Bridge, regrade Denny Hill and, most recently, to launch South Lake Union’s streetcar line, Foster said. The city’s waterfront plans have called for a LID since 2012, and the council initially intended to act in 2014. But the project was put on hold for several years when the giant machine digging a Highway 99 tunnel to replace the viaduct broke down. Now that the machine nicknamed Bertha has completed its mission and set the stage for the tunnel to open later this year, the LID is back on the council’s agenda. 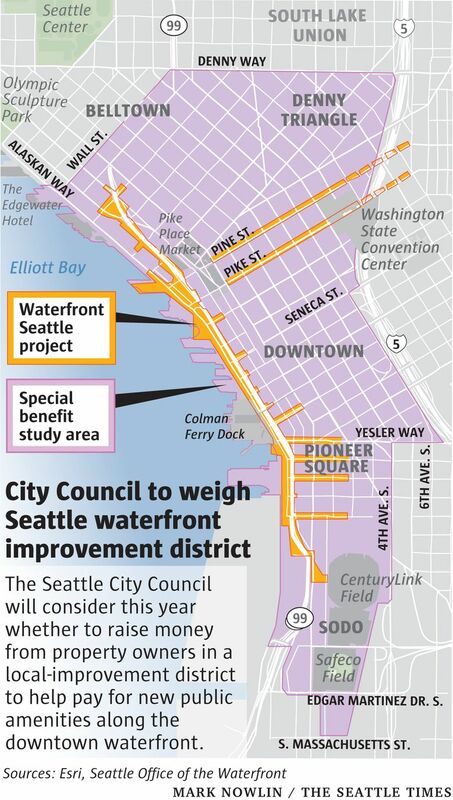 Last year, a city-commissioned study said the amenities — a promenade, renovated Waterfront Park, walkway to Pike Place Market and street improvements — would likely provide nearby property owners with $300 million to $420 million in special benefits. To estimate the benefits, the study assigned “before” and “after” values to sample parcels, reviewed real-estate data and considered economic research on property values near projects in other cities, such as Portland’s Tom McCall Waterfront Park, San Francisco’s Embarcadero and Chicago’s Millennium Park. Now property owners are anxiously awaiting the release of a more detailed study, which will determine anticipated benefits — in dollars — for each parcel in the area, with parcels along the waterfront expected to receive larger benefits than those several blocks away. Absent a successful protest, the council would in 2019 pass legislation setting exact payment amounts for each property owner, preceded by a period for individual appeals. The city would give the property owners the option to pay all at once or over 20 years, with interest, and would start collecting the money as early as late 2019. Steve Danishek, who lives in a Waterfront Landings condominium on Alaskan Way, said he and many owners in the complex are set against the LID. Danishek worries he’ll be made to pay tens of thousands of dollars for a project that he argues won’t improve his everyday life. The condo owner said the new waterfront amenities will make his neighborhood more crowded and difficult to get around. The walkway to Pike Place Market will wrap past his building, Danishek said, mentioning that property taxes already are on rise. Also wary is Tim Harris, executive director of the Real Change Homeless Empowerment Project in Pioneer Square. The neighborhood is where many social-service organizations are headquartered and where many homeless people live, he noted, saying a shiny new waterfront and LID charges may make it more expensive and therefore less of a haven for charities and poor people. “That’s probably going to be an unintended consequence,” Harris said. Unlike Danishek, Martha Barkman, director of design and construction at Mack Urban said her company supports the LID and expects it will be fair. 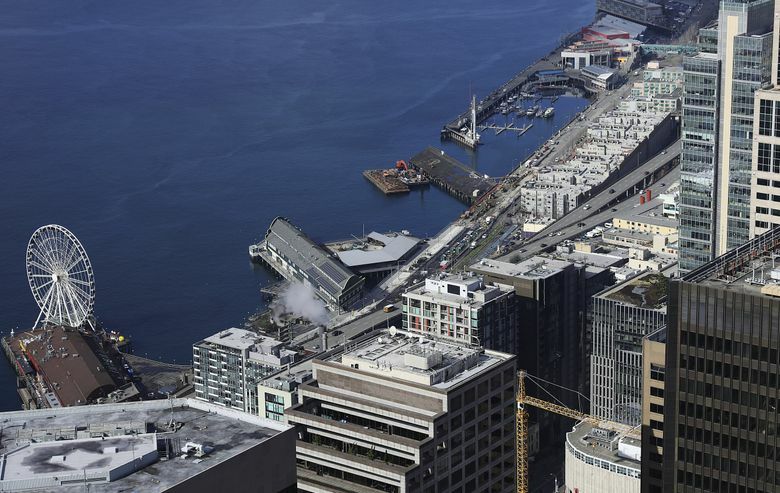 Mack Urban recently developed Cyrene — a 17-story apartment building overlooking Elliott Bay that will have the new waterfront as its backyard, she said. “This will be the fabulous outdoor space that’s been missing downtown,” said Barkman, who serves on the board of Friends of the Waterfront, a nonprofit raising private money for the project. Ryan Smith of Martin Smith Inc., which owns a dozen buildings downtown, is also optimistic. But he still has questions about the project, such as how visitors will reach the new waterfront. Smith said the city’s plan needs more parking and better transit. Jon Scholes, Downtown Seattle Association president, said he wishes the city had waited to set its $200 million goal for the LID until after studying the project’s benefits. “We don’t think the city should be backing into any predetermined number,” he said. Making such estimates can be a tricky business, Scholes added. 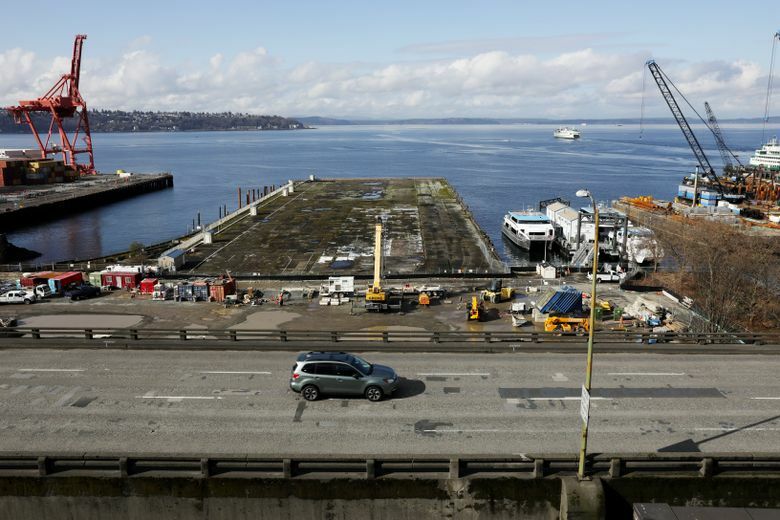 Projects in other cities differ from Seattle’s plan in important ways, and although the demolition of the viaduct will boost property values along the waterfront, the city’s studies have sought to exclude that from their analyses because the LID wouldn’t help pay for the teardown. Foster said his office has delivered dozens of briefings to homeowner associations in the LID area. In addition to property owners, the LID would affect residential and commercial tenants, Scholes said. “This is all about lease rates and housing costs,” the downtown rep said.